Years ago my interest in riding a bike in France grew from watching the Tour de France on TV every July. Honestly I spent years being baffled by the names and locations. It didn't help that the Tour de France basically changes direction every year (clock-wise / counter-clockwise) and frequently starts in distant countries (this year in England). TV commentators and magazines articles throw out names and terms as if I was born knowing what and where these climbs were located in France, but it takes years to learn the lingo of any sport and language of a country. In regards to the Tour de France, it is challenge enough to keep track of what stage is where and whether it is a no-miss gotta see that stage stage. So this year I am planning ahead for the stages and climbs I really want to see. 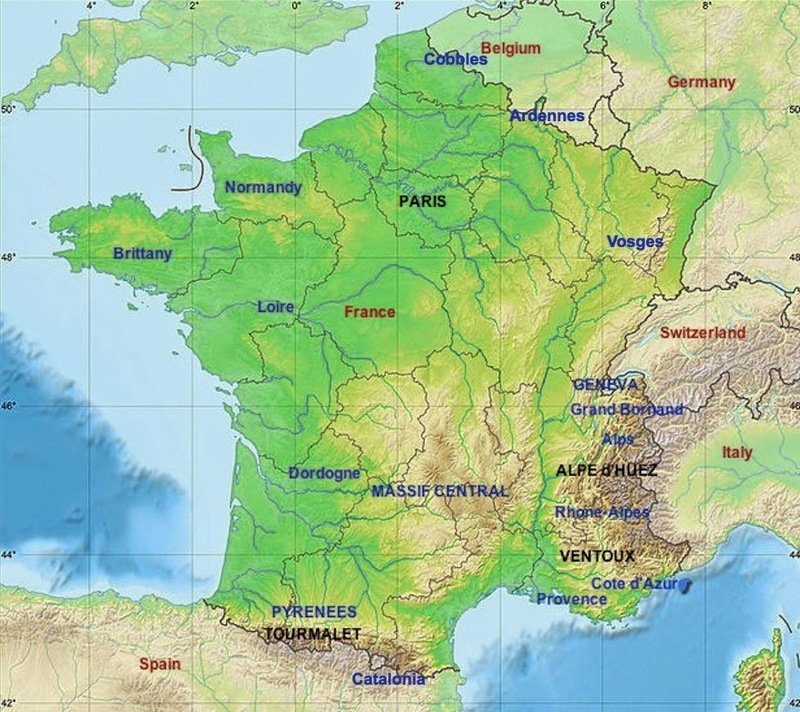 In 2014 the Tour de France begins in England, rumbles clockwise across some cobbles into Belgium and northern France, and then enters the Alps far to the east. The key stages are in the Pyrenees this year, and if a GC man has not developed a clear 3-minute lead by that point in week three, contenders still have the final individual time trial to fight it out in the commune of Bergerac, located in the heart of France. A decade ago I spent hours scouring the internet or squinting at huge paper maps trying to learn more about the climbs of France. Today there are wonderful tools and fellow bloggers who bring the roads of France right to our screens. We are so in the know now that I instantly recognize when Phil and Paul get a geographical fact incorrect, and this from an American sitting in Denver, Colorado. 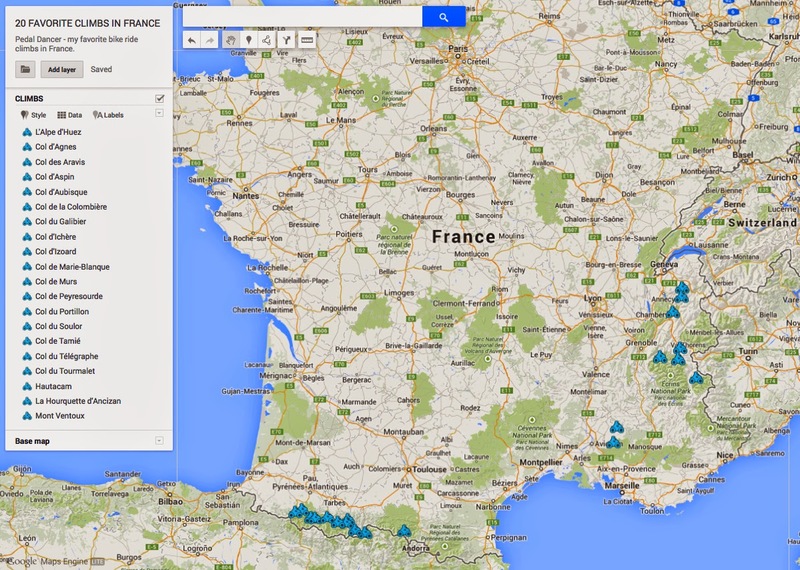 Modern mapping and websites have added greatly to my joy of watching the Tour de France. I would like to recommend these other websites for exact details about the climbs of the 2014 Tour de France. For an excellent detailed map of every climb in the 2014 Tour de France, by Cycling The Alps: Cycling the Alps Tour de France 2014 Stages. I love this collection of climb maps, each climb location map offers 3D tours, profiles, and street views. Veloviewer teamed up with Team SKY for this cool post about the 2014 climbs in the Tour: Tour de France: The Climbs, A unique look at the race's toughest uphill tests. Climbs in England (even if short, 20% is still steep! ): Climbs of Stage One, Tour de France 2014, by HedgehogCycling. A detailed description of the 14 climbs in Stage 2, read: The Climbs of Stage 2 of the 2014 Tour de France – Part 1 and The Climbs of Stage 2 of the 2014 Tour de France – Part 2, by Veloviewer. Forget anything you hear about average grades, these climbs are steep, much steeper than any average measurement or pro rider might indicate. The average cyclists will rejoice in reaching the summit or pass and during three hard weeks of racing, so too will the pros. Alberto Contador was out riding the key stages of the Tour in May. 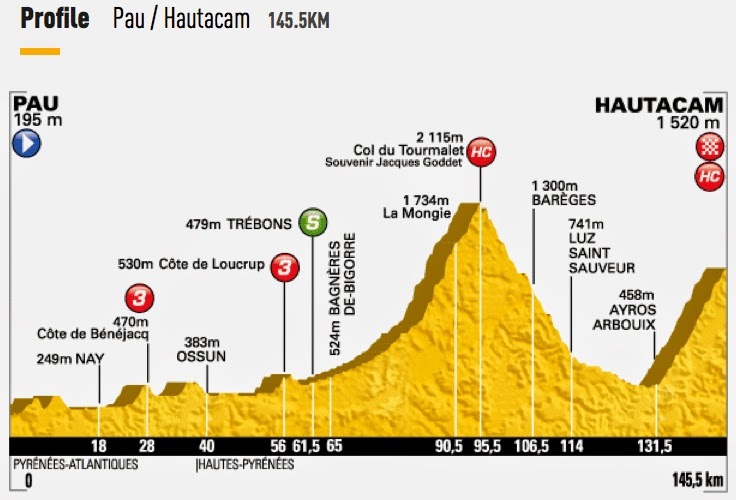 To quote an article in CyclingNews, Contador said, "(The Hautacam stage) will be a very easy day to control." "The stage Saint-Lary [stage 17] will be really tough ... It will be a fast day and difficult to control for the leader. There will be opportunities to make tactical moves." Don't forget about the penultimate stage, the individual time trial, the day before Paris, Contador said about it, "It is really demanding because of it's length. It will be one of the hardest days of the entire race." When the Tour de France first began, there was only one type of mountain - hard. By 1947 Le Tour organizers decided to use two classifications for the climbs (First and Second) to offer additional points. It was so popular that by 1949 a third classification was added, the forth by 1962. We had to wait until 1979 for the most well-known category to be added - Hors Catégorie, the rating which instills fear into most riders. 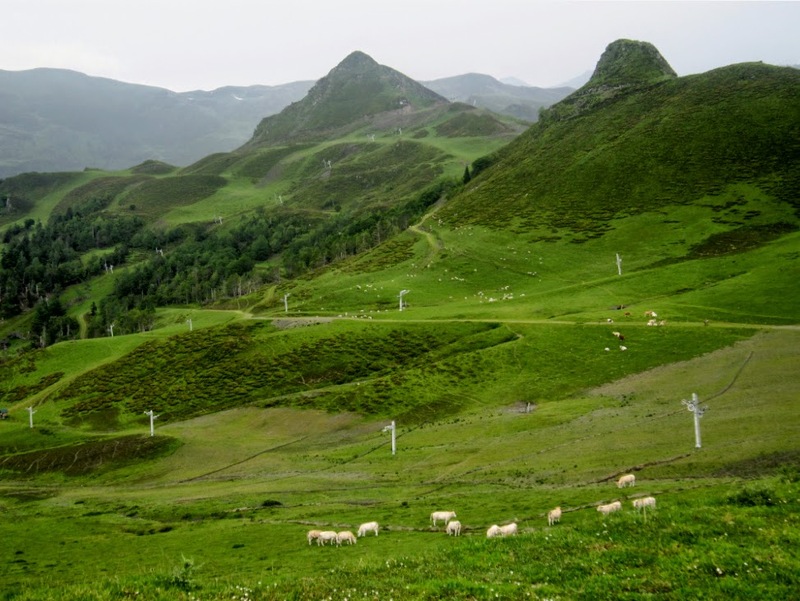 The Col du Tourmalet is the HC climb which has been included most often in the Tour de France. 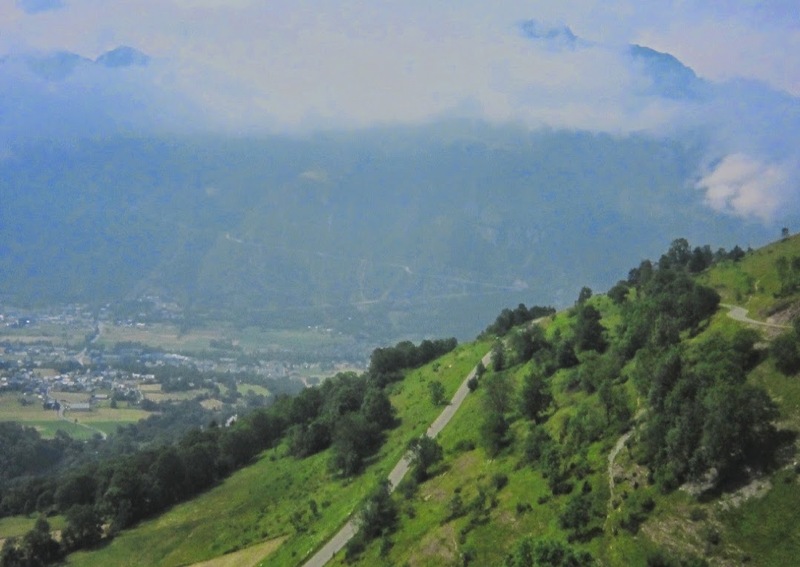 The peloton will again visit it in 2014, followed quickly by another HC climb - Hautacam. Double ouch. The official Le Tour website explains the sporting stakes for the mountain classification in the Tour de France. Rules: The polka-dot is worn by the best climber. Points for the best climber classification are awarded at the top of any classified slope. The prize money is doubled on the stage finishes that will take place at the summit of climbs. Prize money: €25,000 for the overall winner (€109,200 in total). 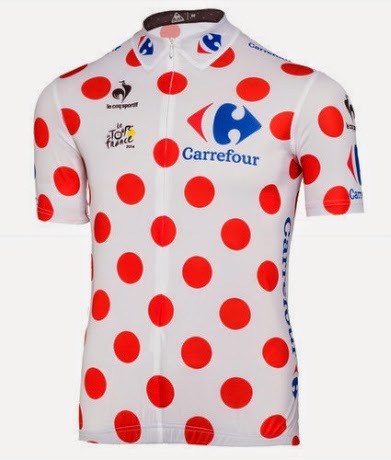 The Polka Dot Jersey is sponsored by Carrefour (a major market chain in France). 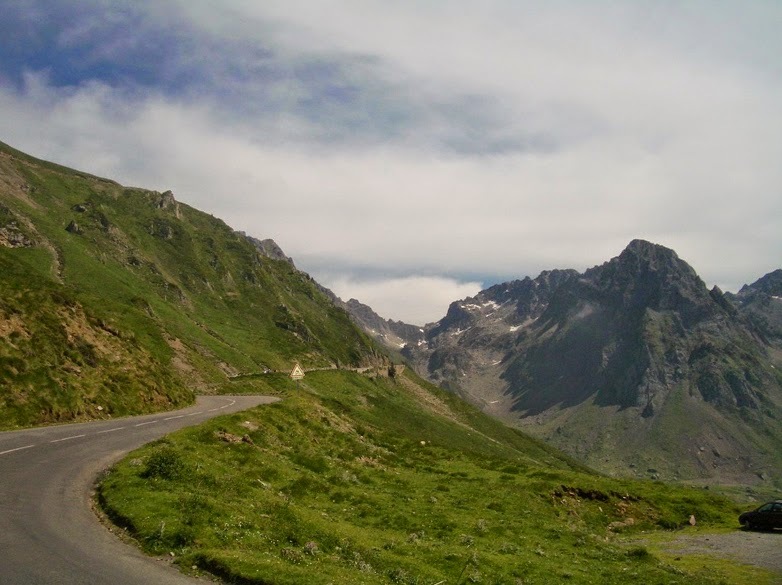 This year, five of my favorite climbs - Col d'Izoard, Col d'Portillon, Col de Peyresourde, Col du Tourmalet and Hautacam - will be featured in the 2014 Tour de France. 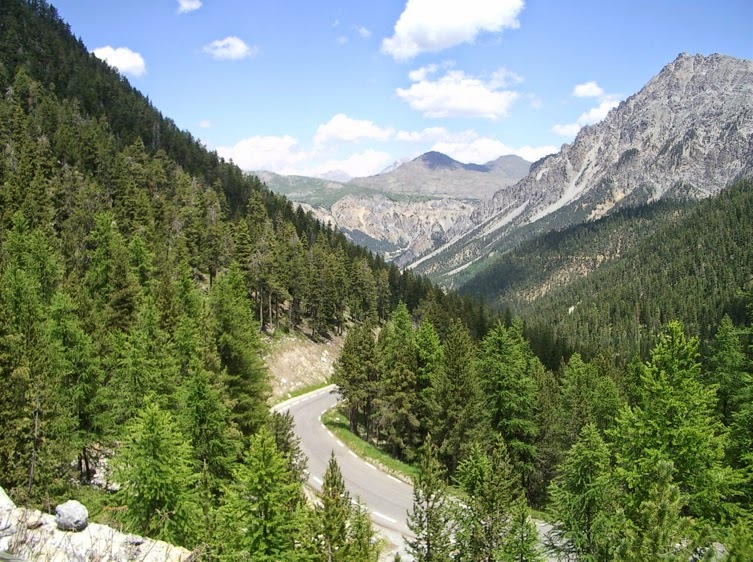 Pyrenees Climbs: My friend Paddy Sweeney at VeloPeloton has compiled an excellent extensive map and quide to the climbs in the Pyrenees. A highly recommended location to start ticking off the climbs on your bucket list. He even offers a Tour de France filter to the map, which will show you all 40 climbs in the Pyrenees ever to be included in the Tour de France. Alps Climbs: Cycling the Alps has a mind blowing maps of ALL the climbs in the French Alps: http://www.cyclingthealps.com. With all these mountains waiting to be climbed - you will definitely need more than one trip to France!